Carmelite Riverside is a £25m office redevelopment on Victoria Embankment, overlooking the River Thames. It was designed by award-winning architects Fletcher Priest for Quadrant Estates, and built by Morgan Sindall. The redevelopment provides 135,000 sq ft of grade A office space with BREEAM Excellent rating. 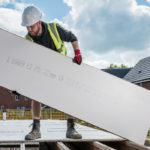 STEICO one of the largest suppliers of engineered I Joists to the UK market and the largest producer in Europe introduces STEICO total floor. A Cambridgeshire-based international fulfilment company James and James Fulfilment has specified Array and Broadrib carpet from Heckmondwike FB’s Creative ranges to transform its office areas. Caparo Wire manufactures a wide range of specialist cold heading, bedding & seating and galvanised and engineering wires and, at its Wrexham site, had to frequently replace its flooring due to its non-slip properties wearing down. A combination of Polyflor’s Polysafe Verona PUR vinyl safety flooring in two complementary shades has been used to create an eye-catching dining hall at The Sutton Academy in St Helens.